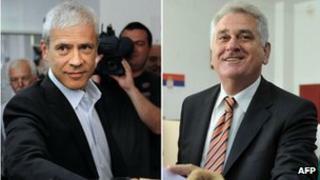 The rivals for Serbia's presidency, liberal incumbent Boris Tadic and ex-nationalist Tomislav Nikolic, will face each other in a run-off on 20 May. Mr Tadic polled around 26%, the latest estimates say, while Mr Nikolic was around one percentage point behind. Serbia won EU candidate status in March and although both men say they back membership, Mr Nikolic strongly opposed the step some years ago. The candidates' political parties were also very close in parliamentary polls. Mr Nikolic's Serbian Progressive Party (SNS) appeared to be narrowly ahead of Mr Tadic's Democratic Party (DS). But final results for the parliamentary elections will not be released until Thursday. The BBC's Nick Thorpe in Belgrade says that the first surprise of the election was the strong showing of the Socialists, led by Interior Minister Ivica Dacic, who gained around 16% of the vote. That would put them in with a strong chance of joining a coalition with Mr Dacic as potential prime minister, he says. The governing Democratic Party have been punished by an electorate who blame them for doing too little to improve their standard of living. The Democrats have been in power for 12 years, since the fall of Slobodan Milosevic and his Socialist Party. The Socialists bounced back in this election, almost doubling their vote to play the role of kingmaker in the next government - "we have risen from the ashes", said their leader, Ivica Dacic, who is now widely tipped for the post of prime minister. Most parties favour EU membership. The old split between pro-European and pro-Russian parties, is over. The Socialists were founded in the 1990s by former Yugoslav President Slobodan Milosevic, who was put on trial for genocide at The Hague, but they are now seen as pro-EU and were part of the outgoing coalition government. Another surprise is the relatively poor showing of the nationalist Serbian Radical Party who were allies of Slobodan Milosevic during the conflict in Kosovo in 1999. Mr Tadic, who has been in power since 2004, will face Mr Nikolic in a run-off vote for the third time running, having beaten him on the two previous occasions. He stepped down as president last month, forcing an early presidential election alongside the parliamentary vote. The campaign was dominated by questions over the future of the Serbian economy with unemployment at 24% and a foreign debt of 24bn euros (£19.5bn; $31.5bn). Because of the economic difficulties, Mr Nikolic had been expected to perform better than Mr Tadic and his party in both votes. The first round of the presidential election featured 12 candidates. Mr Tadic, 54, was a key player in Serbia's talks with the EU and said that his party's continuation in power was necessary for Serbia's future development and stability. He also promised reform and better living standards for Serbs. Mr Nikolic once said he would rather see Serbia ally itself with Russia than join the EU but has softened his rhetoric in recent years.